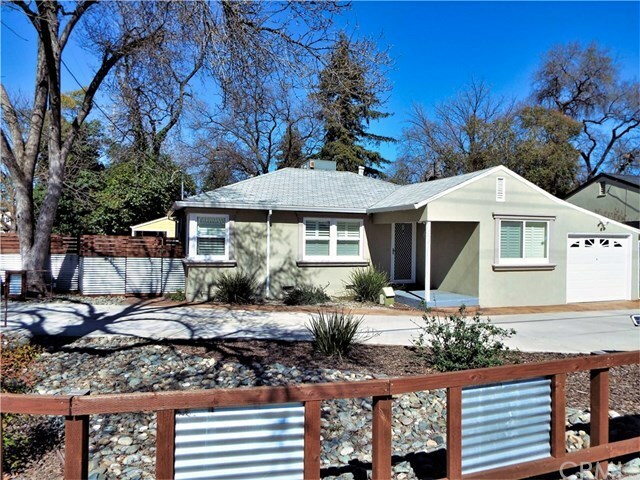 Cute Chico Charmer in convenient location near schools, shopping, churches, the City library and public transportation. You'll recognize this home by its unique corrugated/iron fence. Pull through driveway and automatic gates, low maintenance yard and, there is also a private, gated side driveway with space for RV/boat parking! Inside you'll find a nicely remodeled kitchen with all the modern updates you'd hope for: granite counters, decorative backsplash, stainless appliances and a convenient laundry room just off the kitchen. Cute dining area, large living room and split bedroom floor plan. Plantation shutters throughout most of the home, custom paint inside and, newer stucco outside. Recently connected to City sewer and many updates in and out over the years. NOTES: 2 Bedrooms per public records, agent notes 3 Bedrooms, buyer to verify. Information obtained through sources deemed reliable but, cannot be guaranteed as to accuracy nor has it been verified by agent. Buyers advised to investigate all information/aspects of the property to their satisfaction. Information of special interest should be obtained through independent verification. Directions: Corner of E 1st Ave and Arbutus Ave.